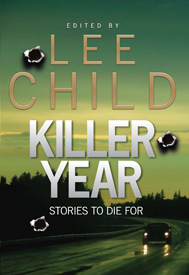 Killer Year: Stories to Die For, the awesome, endlessly readable short-story anthology edited by the mighty Lee Child, is now available in the United Kingdom, and Australia. 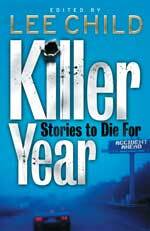 Killer Year features 15 stories by some of the best crime writers writing, and one by me. Plucked fresh from the vine are stories by: Brett Battles, Allison Brown, Robert Gregory Brown, Ken Bruen, Bill Cameron, Toni McGee Causey, Sean Chercover, J.T. Ellison, Patry Francis, me (featuring the only other appearance in print of Johnnie LoDuco, narrator of Vinnie’s Head) (Hey, it’s my blog), Derek Nikitas, Gregg Olsen, Jason Pinter, Marcus Sakey, Duane Swierczynski, and Dave White. My short story, “California Racing Pigs,” is now available on Seth Harwood’s awesome crimestory podcast, Crimewav. Give it a listen, and browse through the truly wonderful selection of great crime writers reading their own works aloud. It’s a lot of fun. And be sure to check out Seth’s own stuff. In addition to being the host and presenter of Crimewav, he is the author of the Jack Palms series of p.i. novels, available now as podcasts through his website SethHarwood.com. The print edition will hit stores next spring. I get a new idea for a book project. I like it; it’s different from what I’ve been working on, shiny and new, filled with all possibility. But the project as it exists in my head requires an in-depth knowledge of certain things–knowledge I don’t really have, though I’m generally familiar with the subject. Research is required. But that’s all right–I really like research. The web is very useful in assembling book lists and outlining the topic. Instant wisdom: I love me some search engines. Some really useful articles can be found online too. But as I read over the spines in my book accumulation, I realize that, from years of poking around the edges of the topic and returning obsessively to it again and again, I have a lot of the needful books already. I pull them down from the shelves and make a big pile of them next to the couch where I do most of my reading. Right at my elbow. Then I sit down and admire them, their comprehensiveness, the multiple insights they’ll provide, the sparks of new information that will give me compelling details, plot points, new books even! Some of the books I’ve read already, not recently though. Others I’ve never got around to somehow, but always knew they’d come in handy some day. Someday soon I will read my way down the stack. Once the book-henge is created, it’s almost superfluous to actually write the novel. One day while I am sitting, not reading, but admiring the stack, it occurs to me that one book, one I’ve already read, and that superficially relates to the topic, doesn’t really belong. I get up. I take the offending volume out of the stack. I leaf through it to confirm my judgment. Just as i thought; it doesn’t fit. I return it to the shelves. I feel a great sense of accomplishment. Hey, I’m done for the day!